– Wants to collect a lot of mobile phone number opt-in but find it takes too long? – Wants to organize a lucky draw and find it too tedious? – Wants to have an viral effect of your marketing campaign? – Wants to use SMS to conduct a lucky draw? GT Notify Instant Win module can help you to achieve the goal and alleviate all the pain. Traditional Lucky draw is a waste of time and effort! We all have the experience of the traditional lucky draw, organizer either distribute the per-prepared ticket with the unique number to each of the guest or collect the guest name card into a box for the lucky draw. After the lucky draw, organizer will need to key in the name card information or just throw those ticket away. With GT Notify instant-win feature, event organizer can easily setup a Instant-Win campaign by simply clicking a mouse. During the lucky draw period, organizer just announce the system number and ask the guest to SMS the campaign keyword. Guest will immediately know whether they win or lose when they got the replied SMS message. And they may given a few more chance to try. Organizer will only need to present the price to the winner when the winner present their received winning message. It is just so easy and fun! The best part for the event organizer is that all the participator contact number have been collected automatically in the database, and there is no extra effort needed to key in the data or handling the paper work at all. For the restaurant business, to have customer play the SMS instant-win to win a free drink or dish will not only excite the customer, they will also likely to share with their family and friends and it may easily go viral. The application of this new feature is just endless, it is so easy to setup and people will addictive to it and even expecting your next campaign. This is the keyword people will send to your GT Notify system, and you will market this keyword and let people know about it when you want them to play the game. 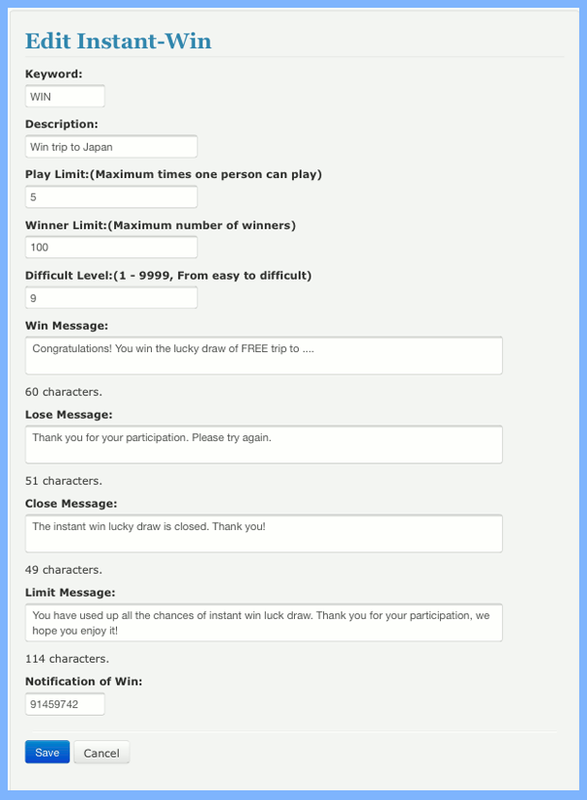 Some examples are like : win, lucky, your event name, or price name, etc. This is the number define how many times one people can play the game. For example, it is set to 3, that means one people (one mobile phone) can play 3 times of this game. When he or she send the keyword 4th time to the system, the system will automatically respond the exceeding limit message. This is the number define how many people can win the prize. If you prepared 10 sets of prize for the winner, you should set the number to 10. Every time one person get the win message, this number will reduce one, so when all the prize been taken, the game will automatically close. And the rest of the player will received the close message if they continue play. This is the number define how easy or how difficult for a person to win. If the number set to 1, every people will sure win. If the number set to 2, 50% chance the people will win. If the number set to 10, 10% chance the people will win. if the number set to 9999, then 0.001% chance the people will win. You got the idea. It’s up to the organizer to set the win rate. This is the message will be sent out when a person win. This is the message will be sent out when a person does not win. This is the message will be send out when the game closed. Either all the price been taken or organizer close the game. This is the message will be send out when a person reaches the play limit. This is the event organizer mobile phone number. When a person win, GT Notify will send a notification to the event organizer mobile phone, so the event organizer will be ready for the price award. How does the GT Notify Instant Win lucky draw really work? I am very sure people will be curious about how the game works? Is it fair? Any loop hole people can explore? Let’s disclose a little bit secret of game, and let people understand more about this. There is a traditional Chinese fortune teller method called Yi-Jing, it is based on a person’s number, any number will do, like birthday, how many stroke of their name, their car plate number, their mobile phone number. GT Notify system use the person’s mobile phone number, with the time stamp, and with the secret random number to draw the winner. So if a person will the price, he or she must be a lucky person at that moment ?